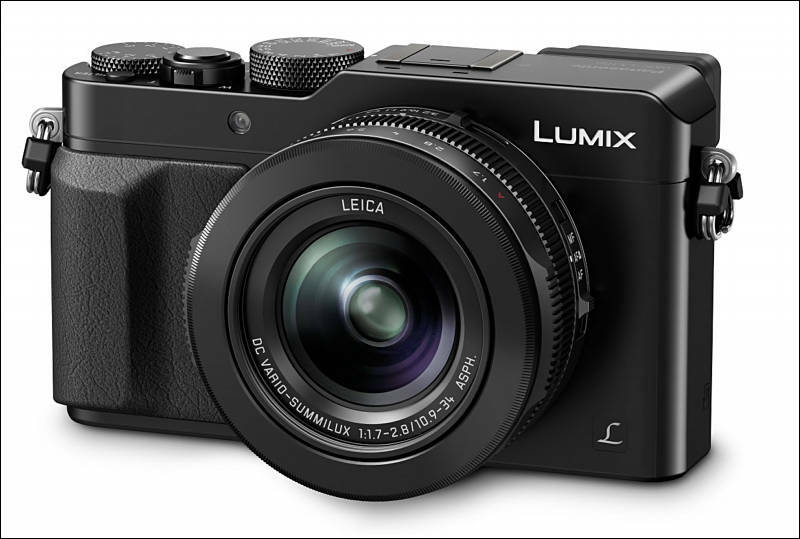 Panasonic is today launching the LUMIX DMC-LX100, its new flagship premium compact camera which sets a new standard for fixed lens photography and videography. Combining Panasonic’s state-of-the-art digital and optical technologies with advanced manual controls, the camera has been engineered to help you push the boundaries of your photographic creativity. The LUMIX LX100 is the 6th generation of Panasonic’s world-renowned LX high-end compact camera series, and inherits the DNA of the LUMIX LC1 – Panasonic’s first fully manual compact camera released in 2004. Featuring a 4/3-inch large High Sensitivity MOS Sensor – more than five times larger than the sensor in the LUMIX LX7 – the LUMIX LX100 boasts image quality you would expect from an interchangeable lens camera. With a 4/3-inch high sensitivity MOS sensor, in combination with a newly developed Venus Engine, the LUMIX LX100 provides superb image quality, whatever the situation. The large sensor means you can achieve superb shallow depth of field shots, and the sensor’s excellent signal-to-noise ratio results in a dramatic reduction in noise when shooting at high ISO levels. The newly developed Venus Engine features a quad-core CPU, boosting performance and enabling the high speed signal processing required for rich video recording in 4K. The new Venus Engine has also been developed to feature multiple noise reduction systems such as Multi Process NR, Random Filter and Aperture Filter ensuring the most natural images, even in extreme low-light. The LUMIX LX100 incorporates Panasonic’s newly developed LEICA DC VARIO-SUMMILUX F1.7-F2.8 lens, which allows you to achieve stunning, true-to-life images with outstanding crispness and clarity. The lens’ versatile zoom range of 24-75mm (35mm camera equivalent) is suitable for all kinds of shooting, from street photography to portraits, while landscapes can be captured in dynamic 24mm wide angle in 4:3, 3:2 or 16:9, thanks to the multi-aspect sensor. Featuring a wide variety of advanced functions and controls, the LUMIX LX100 has been designed to spur the potential of advanced enthusiasts and seasoned photographers alike. With an integrated Live View Finder (LVF) with 2764K-dot equivalent high resolution, you can have full control over the framing, composition and being able to handle extreme lighting whatever the environment. The camera also provides superb manual controls so that you can truly hone your photography skills, including dedicated physical rings and dials such as an aperture ring, a control ring, a shutter speed dial and an exposure compensation dial. The use of physical dials means that you have direct access to settings which can be changed quickly without having to go through a digital menu. Incorporating Panasonic’s Depth From Defocus (DFD) technology, the LUMIX LX100’s Light Speed Auto Focus (AF) is capable of incredible accuracy and speed. With high speed burst shooting at 11 fps in full resolution, combined with the LUMIX LX100’s short release time lag and quick start-up time, you’ll never miss those special moments. The LUMIX LX100 also comes with new focus options to give you more control than ever. The Full Area AF allows you to set the focus on any part of the approximate 100% field of view, while the focus detect area has increased to 49 zones for the most flexible composition possibilities. With Low Light AF, auto focus works in -3EV light situations, so you can achieve perfect focus even when the stars are your only light source. A combination of the LUMIX LX100’s large sensor and powerful Venus Engine means it is capable of stunning 4K video recording, allowing you to shoot realistic cinematic worlds, full of detail and true colour. The camera offers smooth, high quality video recording in 4K 3840x2160 at 30/25 fps in MP4; as well as high-resolution Full HD 1,920 x 1,080 50p videos in AVCHD Progressive (MPEG-4 / H.264) format. A dedicated button on the top of the camera’s body lets you instantly start recording videos while shooting photos, meaning you can always capture the moment as it happens. In addition to manual controls that enable you to achieve the most flexible and versatile photography, the LUMIX LX100 also features a range of other functions and modes to widen your creative freedom, including Creative Control; Creative Panorama; Focus Peaking; Level Gauge; WB (white balance) bracket; highlight/shadow control; as well as integrated Wi-Fi and NFC connectivity. Rumors telling that other rumors are not so accurate. LOL. We should see close to a 2x crop in 4K mode w/ the multi-aspect sensor. 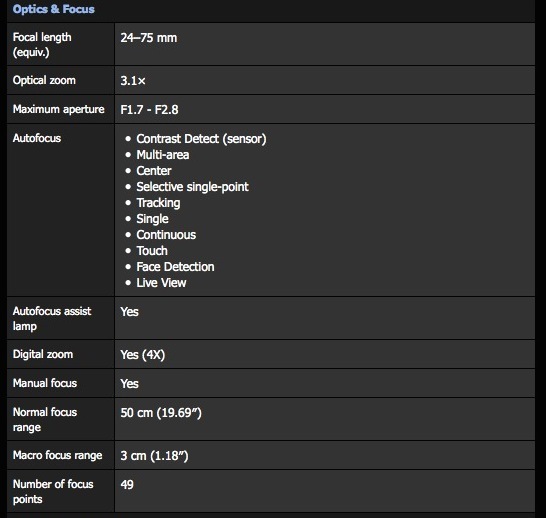 Specs look really great if true and could bode well for future GH cameras that may return to a MAR-sized sensor (1.86x crop). I have now many more info about the LX100. It has a 16MP Four Thirds multi aspect sensor. Which means resolution should be a bit lower than 16MP. The size of the camera is really more compact than the Canon G1xII which uses a similar large sensor (see image on top). 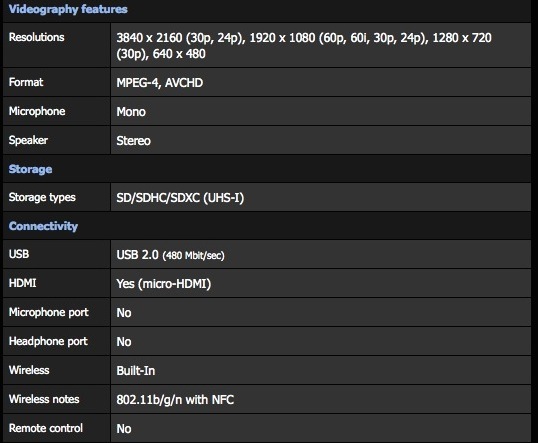 - Sensor: 16MP Multi aspect Four Thirds(!). Real resolution is a bit lower. - ISO 200-25600. Can be extended down to 100! @Tron I am loving the looks what the LX100 is projected to offer. It may be the perfect package. I'm looking forward to the final specs and sample 4k videos. I'm still undecided whether to use a GH4 or a LX100 for future underwater videography. So far, it seems like the LX100 could have everything I need, at a smaller form factor that I much welcome. But it would not be the first time that some arbitrary crippling (like: unusably low bandwidth) was imposed on a new device to limits its usefulness, so I'll wait for confirmed specs before becoming enthusiastic :-). I can understand it being that size with a 1 inch sensor, but surely not four-thirds with that 12-37mm f/1.7 to f/2.8 lens on the end? I struggle to grasp how it could be significantly smaller than the constant aperture 12-35mm f/2.8. I wonder how far the lens protrudes. ....it's a quantum lens assembly. Only the visible portion exists in reality ! The other, hidden lens elements only exist with uncertainty, leaving room for the sensor ! Yes. you can view the sensor, but not measure it, or measure it, but not view it. It is very uncertain. It can also be entangled with another camera. The lens protudes a lot. If you look the size specs, the depth of the camera is almost the height size - like the G1X. And 4K will have a time limitation because of heat, as expected. But still looks like an interesting camera. @karl That's a great point... I agree, this could definitely be the perfect cam for snorkel & scuba photo/video use. You can get an Ikelite housing for an LX7 somewhere around $500, I assume the LX100 would fall at a similar price point. Much nicer than having to get different ports and gears for an interchangeable lens camera. 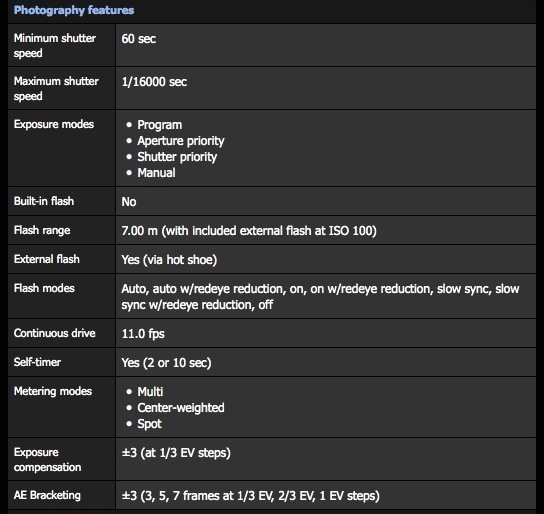 As I recall, the LX cameras have always had decent flash sync speeds as well. @MarcioK I'm not completely certain, but I think the depth dimension is probably for the camera with the lens fully extended. LX cameras have traditionally been designed to remain pocketable when not in use. Seems to be 2.2x crop. And European version has 50p/25p and no 24p. No mic input but at least it has hot shoe. I think this will be my next buy. This one or the GM5. Mono mic is probably a typo, the two stereo mics are clearly visible near the hotshoe. 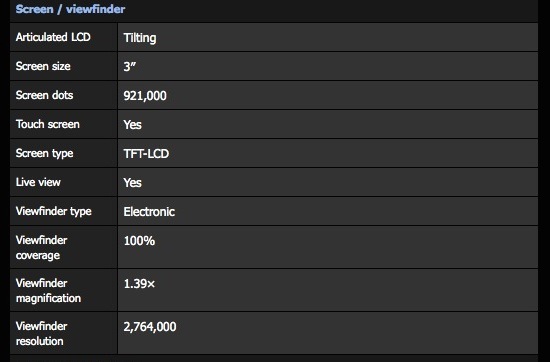 Dpreview already hammering the "teardown" effect in the sequential-field EVF, like they've done with the GX7. Maybe it is a thing with people who uses glasses? I have a GX7 and never noticed it. @MarcioK The EVF for the GF1/GF2 also had that effect. This seems to be the best product Panasonic has done in years. Very nice to get that lens in this price range. Hopefully, 1080P video doesn't have much moire. Is this a compact or a HDSLR ? Anyword on it doing ETC? Now imagine this lens to be released for m43 cameras with $299 retail. If they release a lens like this for m4/3 mount I would happily pay even more. If only you could get that lens separately! Now does anyone know the bitrate at 4K? What kind of crop does 4K have? I do not see a critical spec - what is the stabilization in 4K mode? Power OIS? 5-axis? Searching for it too. 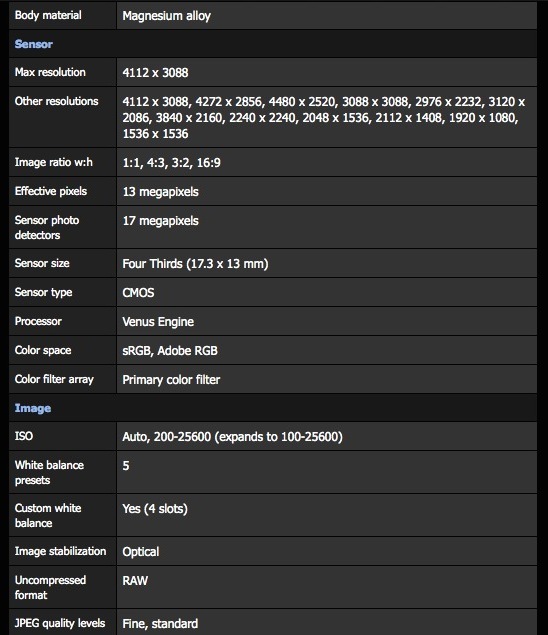 In the DPReview's specs they mention Power OIS, but since there is nothing about in in the lens, I'm in doubt.